Gotta love Santa Rosa; just a single downtown street is named after someone, and that person was a criminal. The street doesn't exist as of this writing (April, 2016) but it will pop back to life soon as the east side of the reunited Courthouse Square as "Hinton Avenue," named in memory of General Otho Hinton who died here in 1865. Why and when he was so honored is unclear; nor is it known if anyone in Santa Rosa was aware he spent years on the lam from federal authorities. Otho Hinton robbed stagecoaches, but not in "Black Bart" fashion with a mask and guns drawn. In 1849 and 1850 he was quietly sneaking into the mailbags which in that era could contain anything, including cash transfers between banks. When he was arrested he was charged with stealing $17 thousand (nearly $800,000 today). The theft was news nationwide because in 1850 that was about how much a typical farmer would scratch together in an entire lifetime. Even more shocking, however, was the identity of the thief. At 48 or 49 years, Hinton was a respected, even esteemed character around Ohio; a popular speaker at political rallies; the founder of a renowned hotel and despite a company bankruptcy a few years earlier, considered a wealthy man with powerful connections. Imagine what it would be like to discover your favorite uncle was actually rich not because he ran a successful business but because he was heisting cars at night. As you read this account of Otho's rags to riches to rags to riches life, keep these things in mind: The man had a silver tongue and an angel's charm. People believed whatever he said. People trusted him even knowing the full nature of his offenses and went out of their way to help him, even putting their own reputations or liberty in jeopardy. Only a single person ever peered into his dank soul and knew him for the scoundrel he was and even wished him dead. That person was his wife. Otho Hinton was born in 1801 or 1802 in Maryland but when he was young the family moved to Delaware, Ohio, a village in the center of the state just above Columbus. History's first glimpse of him was selling walnuts to troops bivouacked there in the War of 1812. He had a simple education before he went to work as a carpenter. He married a woman named Rebecca Gordon and they immediately began having kids. It was an inauspicious start until the stagecoach came to town and his life changed. Today it's difficult to imagine how a stagecoach way station would have transformed a backwater Ohio village like Delaware in 1826. The sleepy community that probably saw few outsiders would now have travelers coming through from all directions, sometimes stopping over. Major newspapers would be available to keep residents up to date; mail would arrive every day. And then there was the exotic glory of the vehicle itself, with a coach large enough to seat up to a dozen people behind a team of thoroughbreds capable of racing to the destination at over eleven miles per hour. My gods, the future had arrived. Hinton began working for the stage company before he was thirty and by the time he was forty was on his way to be the wealthiest man in that part of the state as a major investor in lucrative stage lines. Every chapter of his story shows a man who oozed self-confidence, a man whose powers of persuasion must have been remarkable. He became a General not because of any military experience but because of his popularity (see sidebar). He was in demands as a speaker on behalf the Whig Party despite sounding like an uneducated hick. A local history remarked: "He was a man of ready tongue, slight education and great assurance, and his public speeches, though often ridiculed by his opponents on account of the grammatical inaccuracies they displayed, were generally effective and well received." Once he spoke for 2½ hours in closed room where it was over 100 degrees, and a paper reported he "riveted the attention of his delighted hearers...the audience was as large when he finished as when he begun. The speaker that can accomplish that needs no other praise." THE MAKING OF A "GENERAL"
Otho Hinton never led a single soldier into combat and was never within a thousand miles of a battlefield, yet he was called a General on the slimmest of authority. Still, it was enough for him to get an official military tombstone in Santa Rosa's Rural Cemetery. In Hinton's day each state had a volunteer militia, each broken down into regional divisions. After that were still smaller brigades which had a Brigadier that was was either appointed by the governor or elected by the men. This is how Hinton became Brigadier General of the 2nd Brigade, 13th Division of the Obio State Militia. Every three months the militia met for several days of drills called "Quarterly Musters." One Ohio history reported Hinton "was always to be seen on muster days on a white charger, dressed in a uniform that would have made Phil. Sheridan ashamed of himself" (Civil War General Philip Sheridan famously commanded Union troops in battle while wearing a clean dress uniform with a silver cup in his hand). When the U.S. declared war on Mexico in 1846 it was known only a select few brigades would be invited to fight alongside the regular army, and Hinton lobbied vigorously for his central Ohio brigade to be selected. He spent six weeks in Washington and traveling around the state seeking support from regional militia leaders. A southern Ohio brigade was chosen instead, possibly because Hinton's troops were only a "cornstalk" militia as a local history claims, which was a derisive term meaning the volunteers were so poor or unfit they were using cornstalks instead of rifles at musters. His glory days came in 1845 and 1846. He had his military "career" whereupon he came to be called "General" exclusively, as if it were his given name. The stage lines through the town of Delaware were so successful he built the Hinton House, among the best and largest hotels in Ohio and boasting 100 rooms. His main business, O. Hinton & Co. had already expanded to offer stage service in the far west including Iowa Territory and Wisconsin Territory (this was the 1840s, remember) which included government contracts to carry mail. In 1846 he won a four-year Post Office contract to add parts of Illinois and Missouri. That demanded an urgent and substantial expansion of the company, so late in 1846 Hinton negotiated to buyout his largest competitor. But before that deal was sealed, disaster struck. On December 30 it started to rain and would not stop. The downpour continued for eleven days. Stories appearing in the newspapers were horrific. Herds of animals drowned in flooded pastures. Evacuating residents found escape routes blocked by washed-out bridges. Homes, barns, sawmills and factories disappeared. Some floodwaters rose 18 inches an hour with no end in sight and an Ohio river overflowed its banks by a hundred miles. With so many Midwestern roads impassible and a slow rebuild of the bridges expected, his company - which was already overextended - was incapable of the extraordinary efforts required to transport the mail on time, or even at all. Within a couple of weeks they started abandoning routes, first a portion of southern Illinois and soon the rest of the state. Within three months the business was ruined and in an attempt to embarrass him into paying an overdue bill for an advertisement, a Milwaukee newspaper published a letter from Hinton stating he could not pay the $6 he owed. The paper illustrated the item with a little engraving of a stagecoach which was printed upside down. Lesser men might have been crushed by such a bankruptcy at age 45, but General Hinton was perpetually blind to his own failings. He also knew the stage business as well or better than anyone in the country and had a stellar track record lobbying both Congress and the post office. Soon he was an agent and then general manager for the Ohio Stage Company, which covered much of the nation. It was savvy for the company to have Mr. Personality representing them on the road, but the General's greatest contribution was that he well understood the price of screwing up mail deliveries. The post office had a schedule of fines for mail that arrived late, wet or otherwise damaged. With penalties ranging from a couple of bucks to several hundred dollars, depending on the importance of the destination, a contractor could quickly find himself losing money or even going bankrupt as Otho did. Making sure a small army of drivers and other company agents working over several thousand square miles handled the mail flawlessly was a daunting job of great responsibility and trust. The position gave him considerable freedom to travel where and when he liked, taking him away from his family for extended periods. The General apparently was not terribly lonely on those trips, as he petitioned Rebecca for divorce in 1848. She countered by accusing him of adultery. Margie Hinton, a very distant cousin and an adept genealogist, traveled to Ohio for Otho research and found a trove of Othoabilia at the Delaware county library including papers related to the divorce suit, where his wife reminded him she knew how to load and shoot a gun, implying she would use it if she caught him again with another woman. He complained Rebecca was the cause of almost every setback he had suffered in recent years. The divorce was apparently never finalized. Although he did not know it, the General had a far greater worry: The post office was aware money was being stolen from the mailbags carried by his company. Mail robbery is a federal crime which was then investigated by the Post Office's "Office of Instructions and Mail Depredations" (now the United States Postal Inspection Service). Working together, the Cleveland Postmaster and a Deputy U.S. Marshal found a pattern to the thefts and designed a trap to catch the one particular suspect they believed guilty: General Otho Hinton. There are two significant problems with the very first paragraph in the PD's new (2016) short unbylined piece, which claims "more than 100 people were killed in a community of roughly 8,700." Exactly 77 are certain to have died in Santa Rosa and it can be said with high confidence there were at least 82 (see 1906 earthquake FAQ). While it seems very likely that a hundred or more people probably were killed or died later because of injuries there is zero evidence, so using any number higher than 77 is speculation. Also guesswork is claiming there were "roughly 8,700" in the community. At the end of 1906, the PD estimated the population then at 10,990. There is a thorough discussion concerning the size of Santa Rosa in the FAQ, but I have never seen that 8,700 figure used. As with the death count, the PD does not reveal its source of information. The mistakes continue into the second paragraph: "Entire neighborhoods were reduced to rubble and the city struggled for years to rebuild." Only the courthouse and surrounding commercial blocks were destroyed. About two dozen houses collapsed or were knocked off foundations and many chimneys cracked or fell. Residential damage was blamed mostly on poor construction and no neighborhoods were wiped out. Nor did the city do much struggling to rebuild. Yes, downtown was a mess and major construction zone for the first year, but before the second anniversary the business district was mostly back to normal in lovely new buildings. I have other quibbles with the anniversary piece. It mentions city hall operated from a table on the sidewalk but that probably was only for about a week before it moved to the business and government shantytown hastily slammed together on the vacant lot at Mendocino and Fifth. The item also states the Press Democrat had its own presses rolling again by the end of the month, which is about the least interesting factoid about the disaster. If anything at all should be mentioned about the PD after the earthquake it's that editor Ernest Finley argued vigorously that the needy didn’t deserve aid from the relief fund. Although the little article gets almost all facts wrong, I still give it a passing grade because of the accompanying photographs, many of which I have never before seen from the PD archives. Check them out - but mostly ignore the captions. But enough about the PD today; how did Santa Rosa commemorate the earthquake anniversary a hundred years ago? Answer: It didn't. In San Francisco on April 18, 1916, an estimated 25,000 packed into the Civic Auditorium to hear a program that included a 500 voice chorus, military band and speeches by the mayor and other luminaries. Was there a public event that day in Santa Rosa? That ten year anniversary was also the day Santa Rosa swore in a new mayor and city council. Was there a moment of silence at the ceremony to honor the dead? That day in 1916 was the Tuesday before Easter and Santa Rosa churches were in high gear, with one church offering a three-hour drop-in service on Good Friday. Were any sermons announced giving thanks for parishioners having survived? The Santa Rosa Republican and Press Democrat both offered short, mawkish "ten years after" editorials that really said nothing; the "city has arisen phoenix like from its ashes" because energetic Santa Rosans "with a song in their hearts and laughter on their lips" rebuilt the town better than it was before, blah, blah, yada, etc. The only point to note is the remark in the Republican that "In proportion to its size Santa Rosa suffered more than any other city in the state." Today the claim that Santa Rosa had comparatively more damage and/or more deaths than San Francisco is another common myth. Over 80 percent of San Francisco was destroyed by the earthquake and fire and most of their population was homeless or displaced for up to two years. By contrast, Santa Rosa's relief effort lasted 17 days with no refugee camps or emergency housing. Electricity was restored within a week and most downtown businesses were operating again within four days at temporary locations. There were no fires in Santa Rosa residential areas. No matter how much one squints at comparisons, it's impossible to honestly claim Santa Rosa suffered more than elsewhere. A quite interesting article did appear in the Republican a few days later, however, showing a tally of year-by-year building permits issued over the previous decade. It showed furious activity through the spring of 1908, then a flux following general economic trends. This data will be of great interest to local historians. This morning ten years ago, Santa Rosa was visited by the greatest calamity in its history. The entire business part of the city was destroyed by earthquake and fire; many lives were lost, and the list of wounded was long. The property loss was estimated at nearly five million dollars. Some doubted that the town would ever be rebuilt, but most Santa Rosans were more hopeful, and some even predicted that the work of restoration would be complete in five years. But ten years was more generally regarded as the time that would probably be required. It can be truthfully said today that the restoration is finished, and that the new city is architecturally far better than it was at the time of the disaster. Nearly every building destroyed has been replaced by a building that is larger and finer. The courthouse, the city hall, the banks and hotels are Class A structures, worth many times what the former ones were worth and a credit to the city in every way. The postoffice, the Masonic Temple, the Native Sons' building, the high school annex, and many handsome business structures, testify to the enterprise and the energy of the people in this town that was stricken. It has been a wonderful recovery. Ten years ago today the Pacific Coast rocked with one of the heaviest earthquakes the world has ever known. Following in its wake came a sheet of flame that completed the work of ruin and destruction. Men retired the night before secure in the belief that they were well established in business, and that the future was secure. They were awakened by the temblor to face ruin, death and misery. In proportion to its size Santa Rosa suffered more than any other city in the state. For blocks Fourth street was a mass of ruins, debris and twisted iron. For a moment the people were stunned, helpless, and it seemed, hopeless. Yet before the bricks were cold, before the streets were cleared for traffic, the work of rebuilding began. Men who had been planning their businesses on a $5000 a year basis immediately outline plans calling for a business of double that amount. Men who had owned buildings of wood, or one story structures, planned at once for modern, fireproof two story structures that would be a credit to any city. With a song in their hearts and laughter on their lips; with not a hint of giving up, they set about their titanic task and have builded a city in ten years, better than was built in course of the slow growth more than fifty years previous. And that same spirit is present today and will be present in the generations to come. The will to do, to surmount any and all obstacles, the belief in one's ability to perform the task before one, has made possible the wonderful work of the rebuilding of the City of Roses. No greater monument was ever erected in memory of man's achievement than the achievement itself, in this instance. It is a fact known to few people in Santa Rosa that approximately two and three-quarter millions of dollars have been put into permanent building improvements in Santa Rosa in the past ten years. This is one of the mighty proofs of the advancement of this city since its business district was laid low by earthquake and fire on April 18, 1906. Included within the ten years that have elapsed since that disaster there are many other improvements, such as miles and miles of paved streets, cement sidewalks, curbs and gutters and countless other items that would swell the sum total of city improvements to an enormous figure. There are many other advancements that have been made, but that single total of improvements in permanent buildings, totaling in exact figures, $2,705,302.31, is one of the biggest arguments that Santa Rosa has to show what enormous strides have been made by the city in ten years. From almost nothing to that total in ten years is an achievement for the city which compares favorably with the total expended in San Francisco, considering the size of the two cities for that length of time. The Republican is indebted to City Clerk Herbert B. Snyder for the actual figures covering building operations. Up to the time that he took office there were no summarized records kept of the building permits granted, and it was necessary to consult old records with the aid of the adding machine and bring them up to date. If you ever come across a time machine, avoid Santa Rosa in July, 1913. That month had the all-time hottest temperature (113 in the shade) as enormous wildfires blazed in Marin and Napa; it was also the second year of severe drought, causing the town's reservoir to draw dangerously low. More about all that can be found in an earlier item, "THE AWFUL SUMMER OF 1913" but there was also something else: A terrible stench drifted up from Santa Rosa Creek. The Press Democrat first reported PG&E was suspected as the culprit, as they operated the coal gas plant on the south side of the creek. A story in the PD the following day said the company investigated and it wasn't them, instead suggesting it was probably "vegetation that has decayed," causing the paper to skeptically snort, "at least that is their contention." After weeks of complaints, Dr. Jackson Temple, the town's Health Officer, and a reporter for the Santa Rosa Republican set off in a voyage of disgusting discovery to solve the mystery. Dr. Temple and the reporter started behind the Levin tannery (the current location of 101 Brookwood Avenue). The tannery had a long history of polluting the creek with lime and highly toxic agents such as cyanide used in the manufacture of leather. Citizens had petitioned the City Council to get tough on the tannery and the Dept. of Fish and Game had sued over the poisoning of fish. But on the day of the creek survey, no problems were found - although cynics might wonder if the tannery had been tipped off about the creek investigation, given the business was Santa Rosa's largest employer. More distressing was what they found nearby: "Several piles of rotting vegetables and garbage were found at this spot and were evidently from private houses. There was plenty of evidence that many persons had used the creek for a considerable distance as an open air toilet." As their wagon continued bumping down the dry creek bed (drought, remember) they came to the PG&E gas plant, another source of frequent complaints about foul smells. And again, no problems were found that day, except for "a considerable deposit of lamp black" on the bottom of the creek. Dr. Temple proclaimed it harmless, but he was wrong; lampblack carbon residue was considered as toxic as petroleum tar even back then; in 1906 the Army Corps of Engineers specifically sued the Portland gas company for dumping it into the river and by 1913 PG&E had installed scrubbers at their plants in San Francisco and elsewhere to keep it out of the waterways. So far, so good (mostly) - but as the Republican commented, "a short distance further on, however, came the worst conditions imaginable." The main offenders were two major businesses, side-by-side: The Grace Brothers brewery (today the location of the Hyatt) and the Santa Rosa Tanning Company directly to its south. "The stench arising from this was indescribable," the article said. "It filled the nostrils like blue smoke, filtered down into the lungs, and burned its way to the stomach, where it worked until it gave one the feeling of a bad morning after a worse night. The top of the water was covered solid with a green-black streaked scum, and the water beneath was as black as night." And that wasn't all: "[A]nother sight was met which added greatly to the stench in the neighborhood. A toilet had been built of rough boards in the Mead Clark Lumber Company's yards. The rear of the toilet was open and hung over the creek bank and its contents covered the bank for a distance of many feet." The next - and thankfully, last - horror was the cannery, where "two large streams of water were found pouring into the creek. The water was a wine purple in color and carried with it an orange colored scum, which was added to that from the brewery. Combined, the smell was almost overpowering" Just beyond that was a "great pile of refuse which was rotten and putrid, and which also gave off a most offensive odor." Even though there was no further dumping downstream, the Republican said the stench from the water carried as far as where the creek passes under modern-day Dutton ave. In 1905 the city wrote to the Cameron Septic Tank Company in Chicago requesting plans and costs for a new tank. Told by the company that their system was patented and they required a deposit before providing plans, Santa Rosa ripped off the design and had locals construct it anyway. Cameron Septic sued, and Santa Rosa ended up paying back royalties plus the cost of building the copycat tank. That wooden septic tank was big enough to handle a population of 10,000, although there were already almost that many people in the greater Santa Rosa region. By 1912 the sewer committee reported the "sewage problem is in deplorable condition" as the system was beyond capacity. The original 1886 layout of the sewers called for eight-inch pipe west of Main Street/Mendocino, but only six-inch lines east of there into the main residential neighborhoods. By the early Twentieth Century, these pipes could not handle demands; every winter the sewer mains down Second and Fifth streets backed up. In 1913 the city approved a high water volume, "Wet Wash" laundry at the corner of First and A streets and every time it discharged wastewater, the Second street main line overflowed. The town's solution was to ask the laundry to build a private cesspool but according to the Republican article, they had been dumping it into the creek. Santa Rosa failed to make incremental improvements even when it had the opportunity. After the 1906 earthquake hundreds of connections were repaired and there were new extensions of the sewer mains, all using the inadequate six-inch diameter pipe. When the city added a new line to serve the booming communities south of the Creek in 1914 they used eight-inch mains, which predictably backed up just as they did on Second and Fifth streets. Santa Rosa's solution was to spend more on maintenance - installing new manholes allowing workers to use a sewer cleaning machine that cost the equivalent of about $24,000 today. The winter of 1913-1914 was an El Niño storm season, and Sonoma county was hit hard; in the December 30 storm, Santa Rosa had four inches in 26 hours while Cazadero had fourteen. 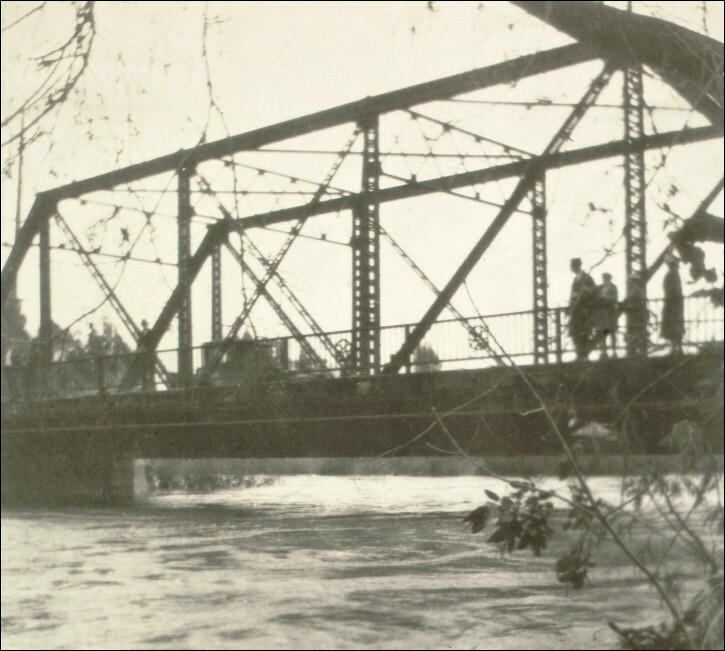 Many "wagon bridges" over creeks around the county were destroyed and the Russian River passed flood stage. Railroad crews and volunteers in Santa Rosa worked through the night to protect the Santa Rosa Creek bridges as "trees and timber of all kinds, fencing and all sorts of trash were being whirled along in the angry, muddy, turbulent stream," according to the Press Democrat. In the thrilling account transcribed below, men with axes and secured by ropes chopped for hours on a tree rammed against the side of the Davis street bridge. The creek probably smelled pretty good after that big flush, at least for a while. But nothing fundamentally changed. According to the Cummings paper, "the city's own sanitary inspector described the condition of the creek in the spring of 1916 as being 'worse than a septic tank' and commented that nothing could be done about it." Thursday morning's Press Democrat mentioned the annoying stench coming from the creek, supposedly caused by gas water from the gas works. It at once recalled the suggestion made long ago that there should be a commercial sewer, into which the drainage from the gas works, tanneries, etc., could be turned in. Several years ago this matter was up for discussion before the city council, and Mayor Mercier and the present council are also interested in the matter. So is Health Officer Jackson Temple, M. D. The gas people state that they made an examination, thinking that there was a leak of gas somewhere, but claim that the stench is probably caused by vegetation that has decayed since the fill was made for the Davis street bridge. At least that is their contention. It is not a pleasant trip in any sense of the word. So much has been said and so much written concerning the Santa Rosa Creek that the REPUBLICAN determined to find out the conditions of the creek from an expert's point of view, and let the people of this city know that condition, its cause and what it's effect will be. The blame for the conditions can be placed at once. When this article is read over and nearly every condition described is noted by the reader, let him say simply, "A commercial sewer will prevent this condition." Just before reaching this another sight was met which added greatly to the stench in the neighborhood. A toilet had been built of rough boards in the Mead Clark Lumber Company's yards. The rear of the toilet was open and hung over the creek bank and its contents covered the bank for a distance of many feet. This also is in direct violation of the law and will be attended to at once by the health authorities. In making a resume and comparing notes of the trip, Dr. Temple was asked what the result would be if these conditions were not attended to and speedily at that. "Sickness, much of it, and in bad forms," was his instant reply. Therefore, while no attempt will be made to point a moral, a question is left which needs a speedy answer: "Will the citizens provide a commercial sewer, or will they invite the inevitable epidemic." Scores of people braved the storm and visited the bridges and at 2 o'clock this morning when a Press Democrat representative made the rounds people were still watching the mighty torrent racing along carrying al kinds of debris with it. About 10 o'clock last night a big willow tree swept down and lodged against the Davis street bridge. Word was at once sent to Mayor Mercier and Street Superintendent Beebe and in a short time they were on hand with men and many of the big branches were cut away. This was accomplished by men with axes who climbed down onto the tree and were held from slipping by ropes placed about their bodies. At 1 o'clock this morning the tree was anchored with stout ropes so as to prevent if possible, its going further down stream to collide with the electric bridge. The high water washed away considerable of the fill on this side of the Davis street bridge, but so far as could be seen the retaining wall on the Ellis street side was not damaged. A portion of the fill on the Main street side where the turn is mde onto the Island bridge, was also washed away. At 2 o'clock this morning Mayor Mercier, Superintendent Beebe and George Plover went out to the old pumping station to look at the bridge across the creek there which also carried the big water main. The bridge was in good condition. 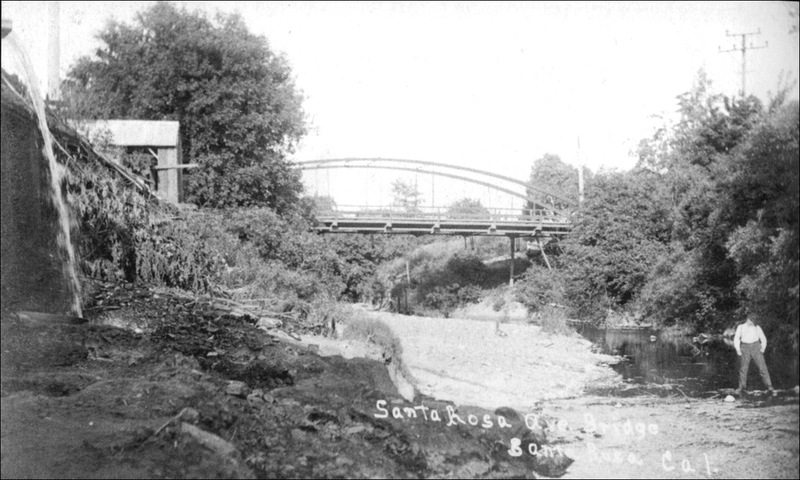 The electric cars to this city stopped on the other sided of the trestle bridge across Santa Rosa creek as it was deemed dangerous, owing to the tremendous torrent to cross. A crew of men employed by the railroad were on hand endeavoring to dislodge any debris that rammed against the structure. This bridge seemed in great danger. The Northwestern Pacific railroad had crew of men watching its bridge across the creek. Santa Rosa creek was a boiling torrent and the roar of the stream could be heard for a long distance. At 2 o'clock the water had fallen considerable but it was raining and a high wind was blowing. ...The amount of debris carried by the waters of the creek was wonderful. When the water was at its highest last night big pieces of wood and other material kept up an almost incessant banging against the Island and Main street bridges, at times somewhat alarming timorous people gathered there. Trees and timber of all kinds, fencing and all sorts of trash were being whirled along in the angry, muddy, turbulent stream. Sure, we knew he had a temper, but punching someone in the face at a City Council meeting? Good grief. "If you deny it, you lie," came the response from Wagner. "You are an old man; I wouldn't hit you." Meanwhile Oates reached for his trousers' pocket as if to secure his knife, but was apparently so agitated that he was unable to locate the pocket. Two councilmen rushed forward, one pinning Oates' arms at his sides and spinning him away from Wagner. "If you will listen like a gentleman, not like a Southern rowdy, I will explain. I am a gentleman, not a Southern rowdy," Wagner said to Oates. Wagner explained he was making a simple contract proposal to the Council. "That was what I was trying to say when Oates called me a liar and put his hand on his hip-pocket for a gun. Why I should be abused and threatened with a licking I don't understand." He asked Oates for an apology. Oates told the Council he opposed Wagner's proposal. He made no apology, nor any reference to having slugged someone moments before. Unfortunately, the PD did not explain exactly what was said to ignite the volatile Oates, except that Wagner was proposing the street work be done under "private contract." The Santa Rosa Republican - where Oates was President of the Board - did not mention the incident at all. From other articles discussed here earlier, however, we can piece most of it together. In that era the town owned the streets as well as the underground water/sewer/coal gas lines. If you wanted the street in front of your house to be paved - or to be clear, if a majority of neighbors on the street wanted pavement - the businesses and homeowners on the street had to pay for it. Property owners also had to pay for concrete curbs and gutters. It was never mentioned how much all this cost, but a couple of years earlier a nearby church sold some of its land because of the "very heavy expense" of the street work. Mendocino avenue was slated to be part of the state's new highway system which would lay pavement, but that would be a year or more in the future. At a special City Council session called by Oates earlier that year, he insisted the work had to be done immediately because conditions were "almost impassible." Or so said Oates, who could claim to know something about the topic as past president of the Sonoma County Automobile Association and an avid automobilist - a couple of weeks after socking Mr. Wagner, Oates traded in his old car for an ultra-luxe Cadillac, which had prices starting at about $3,000 (over $47k adjusted for inflation). Today we might presume the city would have paved the street and mailed a bill or tacked the cost on to property taxes. In 1913 Santa Rosa, however, residential street paving was a new concept, and the precedent they had was creating sidewalks, where the homeowner either poured the concrete himself or hired a contractor, with the city stepping in only if the work wasn't done by the deadline. But streets aren't sidewalks - the work had to be done all at once. You can't have a roadway flipping between pavement and gravel for months while property owners dicker with contractors. Apparently Charles Wagner believed Oates and others had given permission for contractors to negotiate contracts with each property owner, which would have resulted in piecemeal construction. Oates demurred saying anything like that - or as the Press Democrat eloquently put it, he went "Bing!" on the guy. The Mendocino ave. paving issue came up again at Council three weeks later, with Oates asking the Council to go on record requiring the "completion of the work in front of all property when it was once begun." The contractor - which may or may not have been Mr. Bing's company - promised it would. There are a couple of little footnotes to this story: At the Council meeting where Oates started swinging, his law partner and former protégée, Hilliard Comstock, was representing the Matthew Co. in another street construction dispute. That company was owned by his brother Frank and brother-in-law, Win Matthew, so it was quite a family affair in Council chambers that night. The reference to Oates as a "Southern rowdy" also implies he retained his Alabama accent, which was never elsewhere mentioned. Mr. Wagner was more accurate in that description that he probably knew, and he likewise didn't know how lucky he was Oates couldn't reach whatever he sought in his pocket; few, if any, in Santa Rosa were aware he had killed a man in his youth over a matter of honor. There was a sensational scene in the City Council chamber last night, when City Attorney J. W. Oates used the short and ugly word and followed it up with a swing of his right wrist and then reached for his trousers' pocket, presumably in an effort to secure some weapon to enforce his objection to a statement which had just been made by Charles L. Wagner, representing a street contractor, regarding the paving of Mendocino avenue. 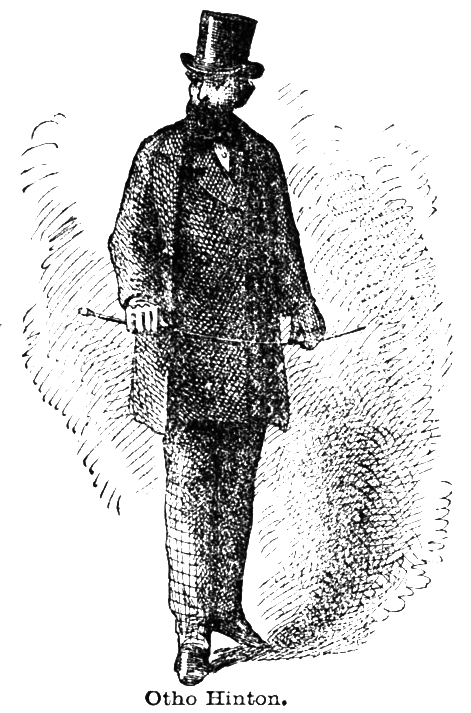 Oates had explained his opposition to the private contract plan of doing the work, when Wagner took the floor to appeal to his members of the Council in favor of the private contract plan, and had only fairly started his argument when Oates jumped to his feet and rushing toward Wagner, attempting to interrupt him. Wagner asked Oates to wait, as he (Oates) had had his say without interruption, and he (Wagner) wanted to give his views. In the excitement Councilmen Pressley and Wolfe jumped to their feet and ran to the two men. Councilman Pressley grabbed the City Attorney from behind, pinning his arms down to his sides and pulled him around and away from Wagner, while Councilman Wolfe jumped beside Wagner, who was standing quietly awaiting the next move. "If you will listen like a gentleman, not like a Southern rowdy, I will explain. I am a gentleman, not a Southern rowdy," said Wagner, addressing Oates. Wagner is a very heavy man and the incident excited him greatly, and for a time he could hardly breathe. After quiet was restored he continued his remarks to the Council, while Oates returned to his seat. "When I came to Santa Rosa," said Wagner, "Mr. Oates told me, street paving could be done by private contract here. Later, I learned in San Francisco, that he had told representatives of another firm that it could. I returned here and after a consultation with the Councilmen, Mayor and Mr. Oates, the latter admitted that paving could be done by private contract. "That was what I was trying to say when Oates called me a liar and put his hand on his hip-pocket for a gun. Why I should be abused and threatened with a licking I don't understand. "It is a business proposition and we were made certain promises by the Council, and if they are broken now it will not be fair dealing. I had no intention of insulting Mr. Oates and he can't take exception to anything I have said, and I think you owe me an apology, Mr. Oates." While Oates took occasion to make his position plain to the Council, he made no reference to the sensational incident in which he had participated previously. He made no effort to apologize or extend the olive branch for his outbreak and assault. No action was taken in the paving matter and it went over to the next meeting and the business once more proceeded in an orderly manner. ...When the petition of the City Improvement Company of San Francisco for permit to pave Mendocino avenue from College avenue to the city limits was called up, City Attorney Oates addressed the Council, explaining that the only objection the property owners had to the plan was the fear that all the street would not be paved, and representing B. W. Paxton and Mrs. Paxton, he asked that the Council go on record to show its intention to force the completion of the work in front of all property when it was once begun. He was readily given that assurance and then declared there would be no further objection to the work.